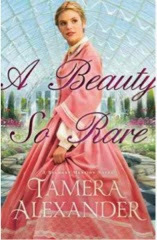 A Beauty So Rare by Tamera Alexander is the second book in the Belmont Mansion Series. It is a stand-alone novel and can be read without reading the first book (once you read this one, you'll want to read the first one). It is set in post-Civil War Nashville. Eleanor Braddock has come to Nashville to seek care for her father and pursue her passion for cooking. Marcus Geoffrey arrived in Nashville from Austria, pursuing his passion for horticulture while trying to escape his obligations in his homeland (if only for a short time). It didn’t take me long to really connect with Eleanor’s character, especially being an older, single female considered by most to be plain-looking in an era (or area) where marital status was considered very important by most. Eleanor has been thrust into the role of caretaker and provider when she should have had someone to provide and care for her. Eleanor is reliant upon the generosity of her aunt, who is trying to pressure her into joining a society in which she doesn’t feel she belongs. Upon her arrival in Nashville, Eleanor meets Marcus. Marcus works on her aunt’s estate with the plants. He is also an architect. Marcus strives for advancements is several areas of horticulture, something which he could not have accomplished in his homeland. As Marcus and Eleanor’s lives become entwined, it doesn’t take long for the reader to feel as if she (or he) is one with the story, a silent character witnessing the scenes of the book firsthand. Mrs. Alexander is a master at weaving the story line, main characters, and sub-characters into altogether to create a novel a person will not soon forget. Her acute attention to the historical details only increases the charm of the story. I fell in love with the characters, and found it extremely hard to put the book down even for a second. If you love romance, and enjoy history, then this book is a must read for you! I received a free copy of this book from the publisher in exchange for an honest and unbiased review. My words and opinions are my own.